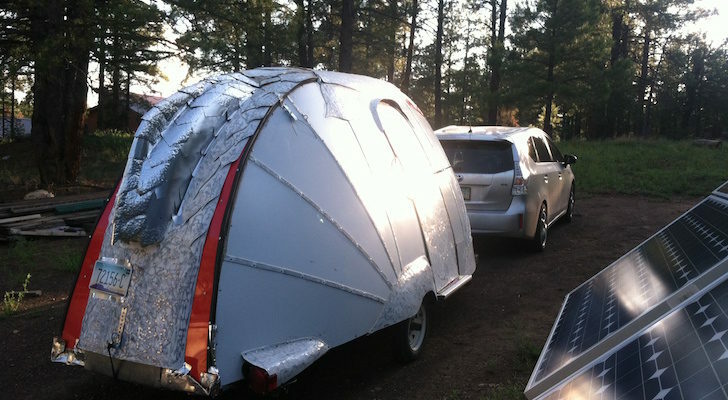 You can never be too safe when driving your motorhome or RV. Stay alert and watch out for the other guy. 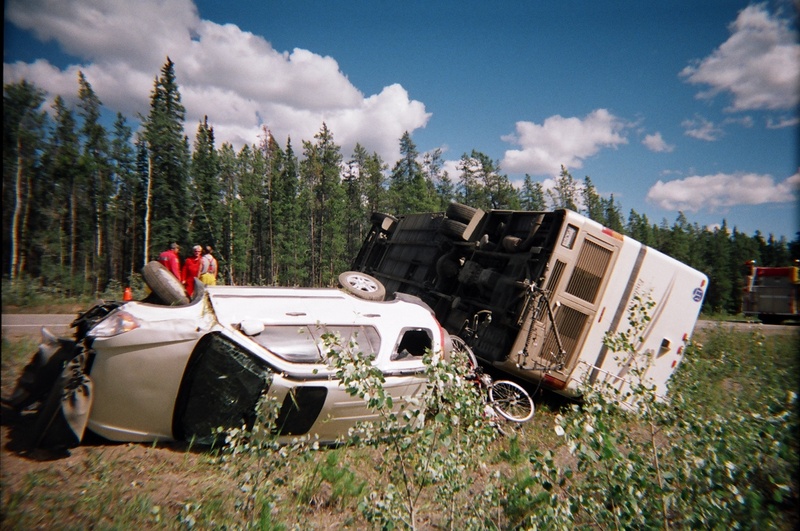 See examples of motorhome accidents here. Caution: You might find some of these images graphic in nature. Getting into any kind of an accident is always a scary event. Usually things happen so fast, that’s it’s only after the dust settles that you figure out what just happened. 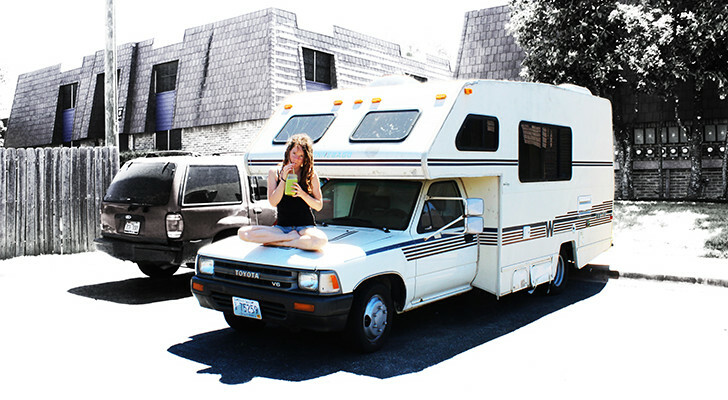 I’ve been in several accidents in a car, and every time it’s scared the you-know-what out of me. 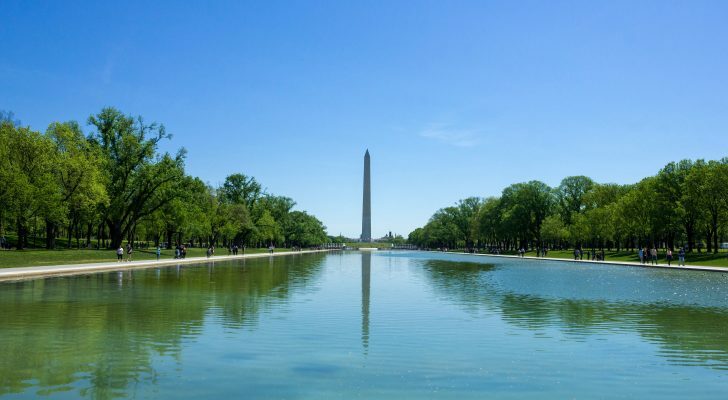 Sometimes accidents are nobody’s fault: tires fail, mechanical equipment breaks, or Mother Nature decides to show her strength. Other times though – we’re to blame. We drive too fast or don’t pay attention to the road or other vehicles like we should. 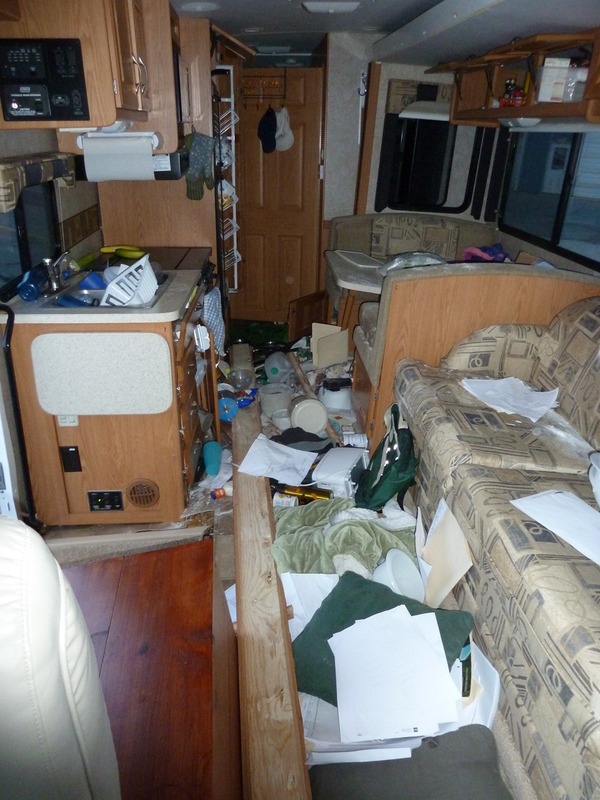 Here’s are a few examples of what can happen when a motorhome has a bad day. 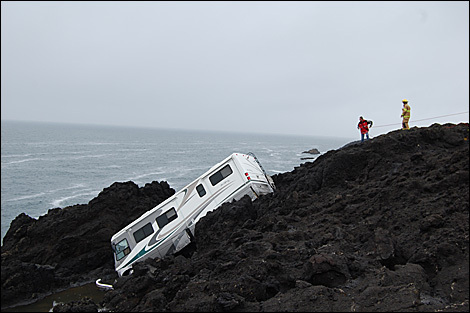 The driver of this motorhome tried to avoid going into a ditch and swerved too sharply. 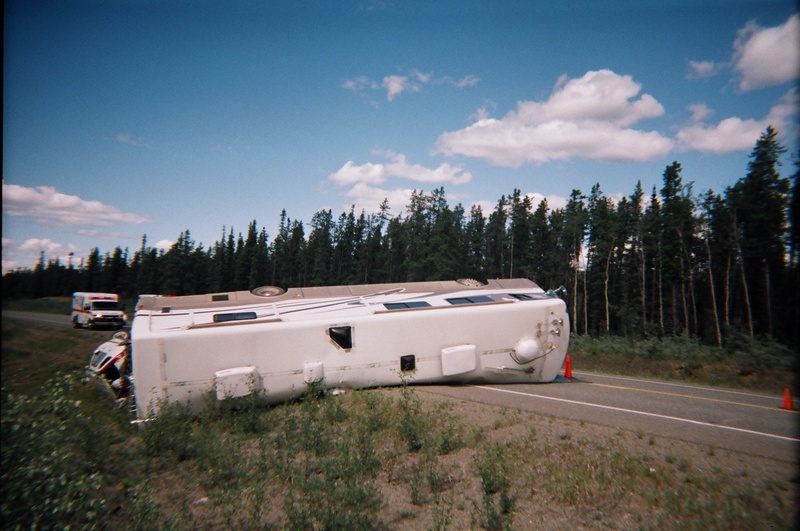 The force of the turn flipped the motorhome. In desperation the driver of the motorhome swerved to stop from going into a ditch, but he wasn’t able to stop the RV from tipping over. You’ve probably seen one of these photos floating around the Internet, but here’s the story of what actually happened. A seventy nine year old man decided to walk his dog on the Oregon coast. 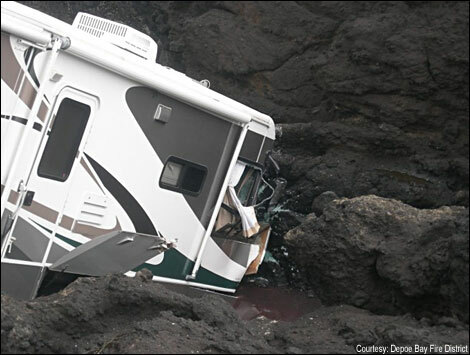 But as soon as he stepped out of his motorhome, the brakes failed and he watched helplessly as it slid 100 feet down a rocky cliff toward the Pacific Ocean. 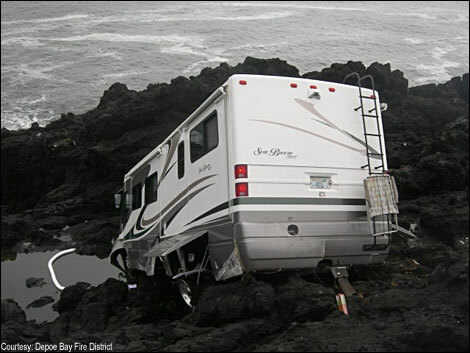 The motorhome remained perched on the rocks until a heavy duty tow truck could come to pull it out of it’s misery. 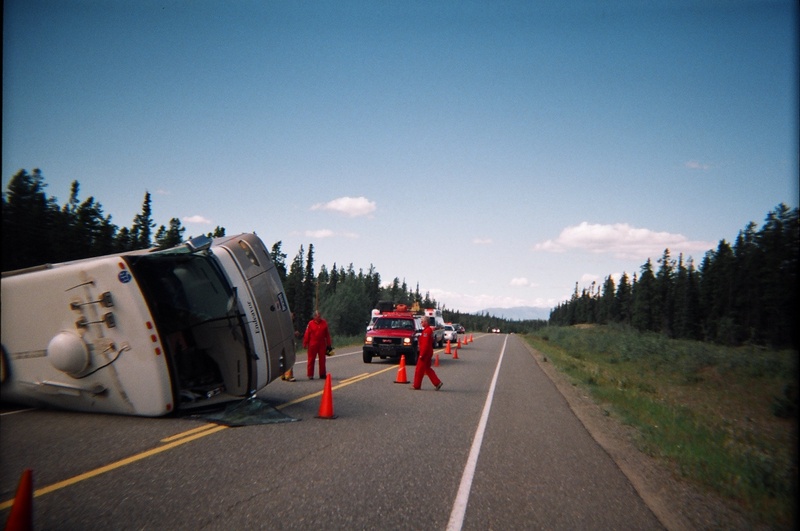 Many accidents involving RVs occur in isolated areas. Sometimes though, other vehicles are involved. 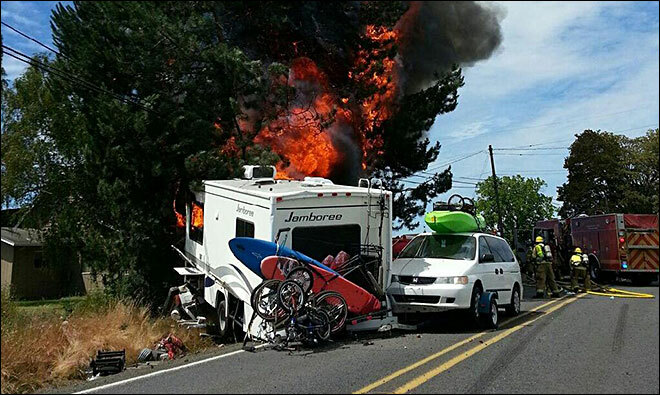 In Forest Grove, Oregon an SUV crashed into a motorhome, resulting in a fiery crash. The driver of a Jeep Cherokee wasn’t able to slow down in time for stopped traffic, so he swerved into the other lane! 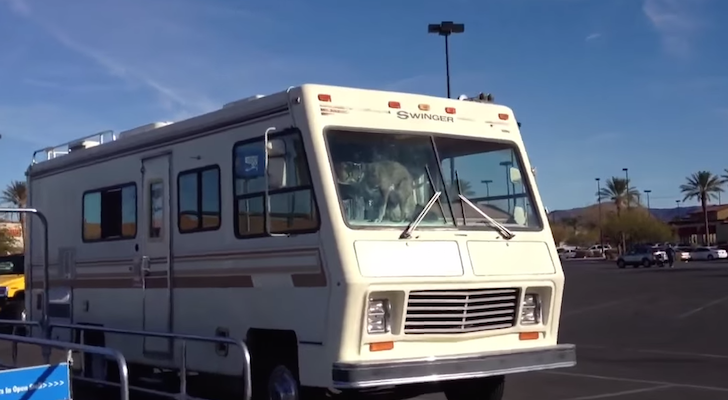 He hit the RV head on, and the motorhome ended up on top of him. The driver of the SUV was cited for possession of Marijuana and for following too closely. 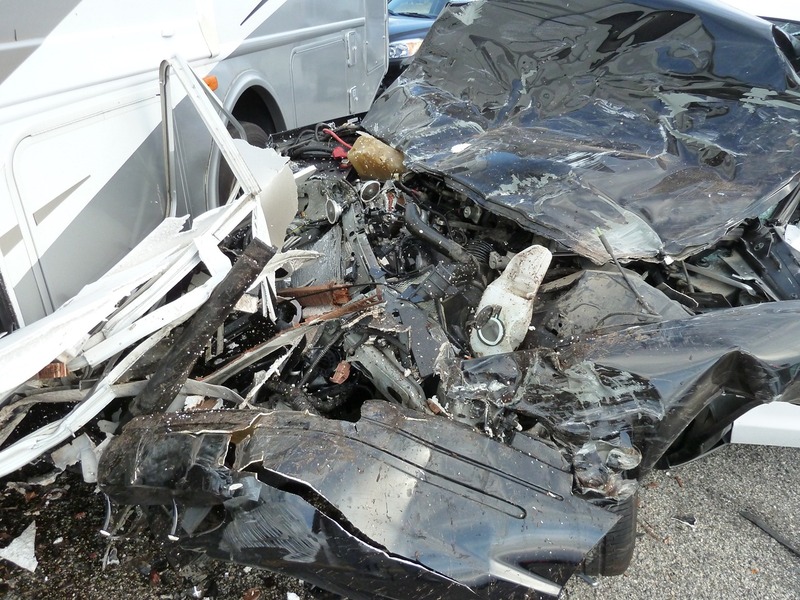 No one in the motorhome was seriously injured, although the driver of the Jeep Cherokee had to be flown to a hospital. 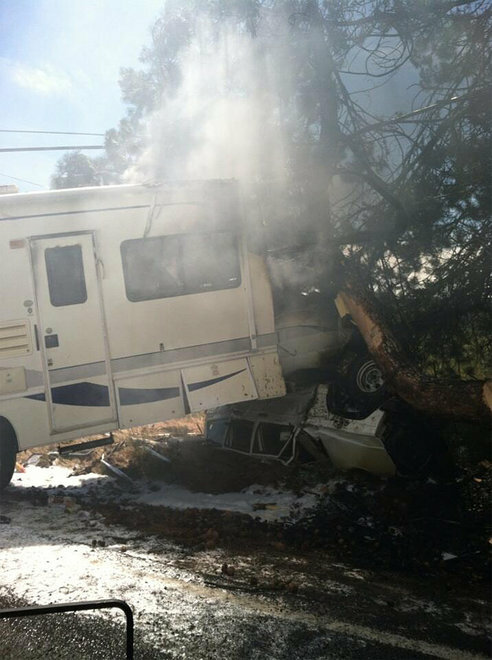 The Jeep Cherokee which caused the accident is pinned underneath the burning motorhome. 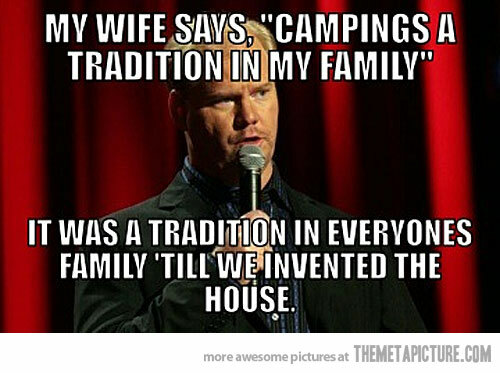 The laws of physics usually determine who pays the price in an accident. 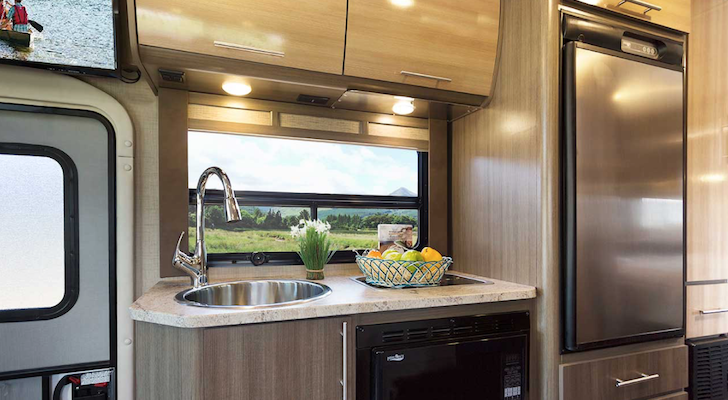 When a small SUV crashes into a Class A motorhome, it’s usually the driver and passengers in the SUV who come out the worst. 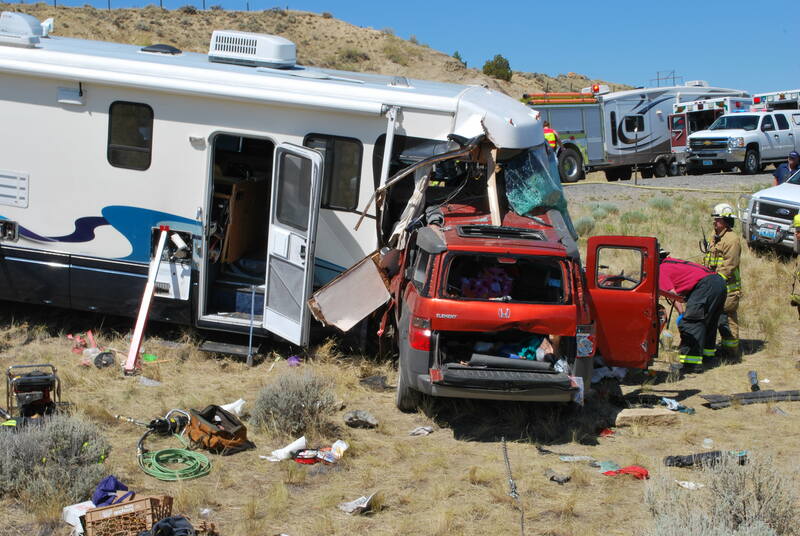 In this case, four people died in an SUV when it crashed into the side of a motorhome in rural Wyoming. 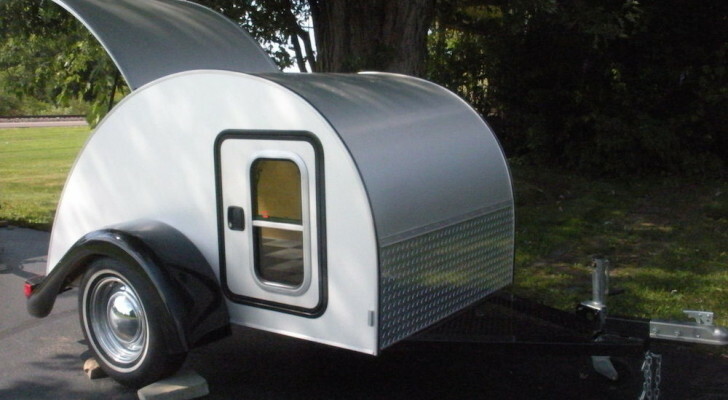 Also killed was a three year old passenger in the motorhome. 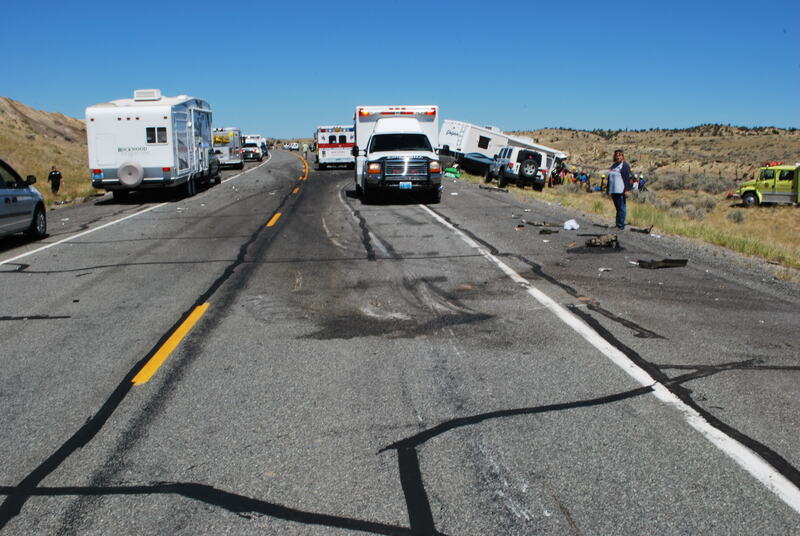 According to witnesses, the driver of the SUV veered into the oncoming lane and crashed head-on into the motorhome. Investigators found no evidence of breaking from either vehicle. 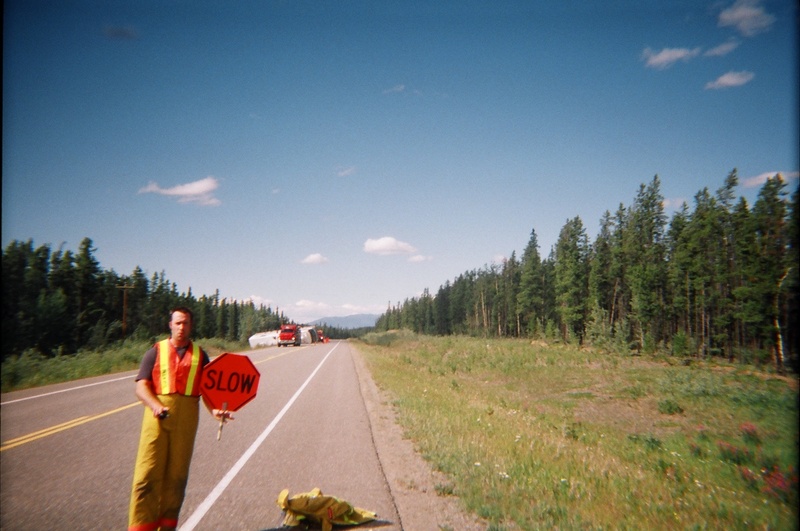 This accident is from the “strange but true” files. 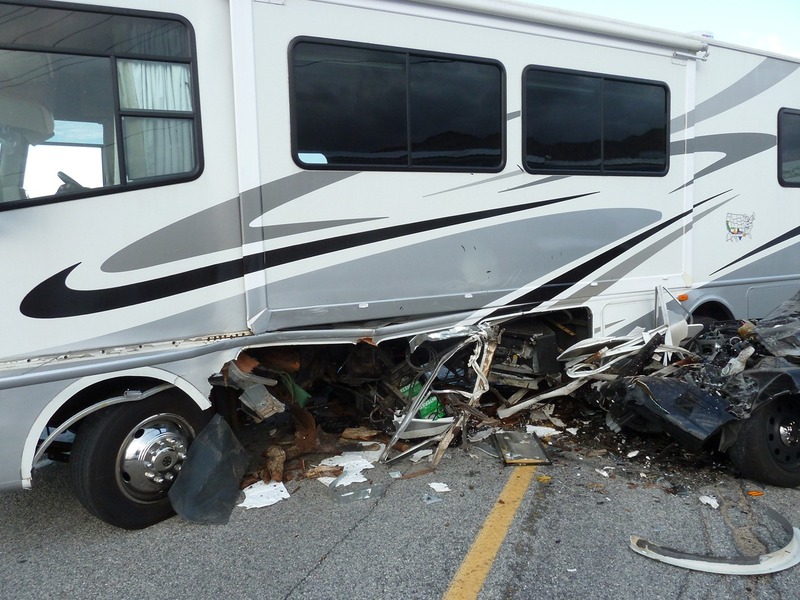 Timm and Theresa from TnTRV were involved in a bizarre accident in 2012 while driving their RV. 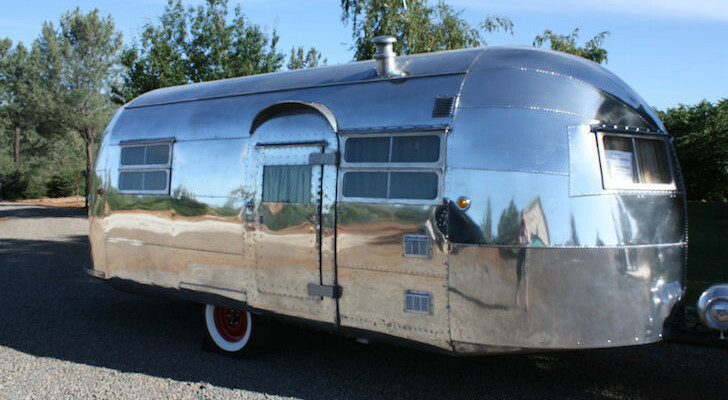 A California Highway Patrol Officer was chasing a suspect at high speeds through the desert in Joshua Tree, California. 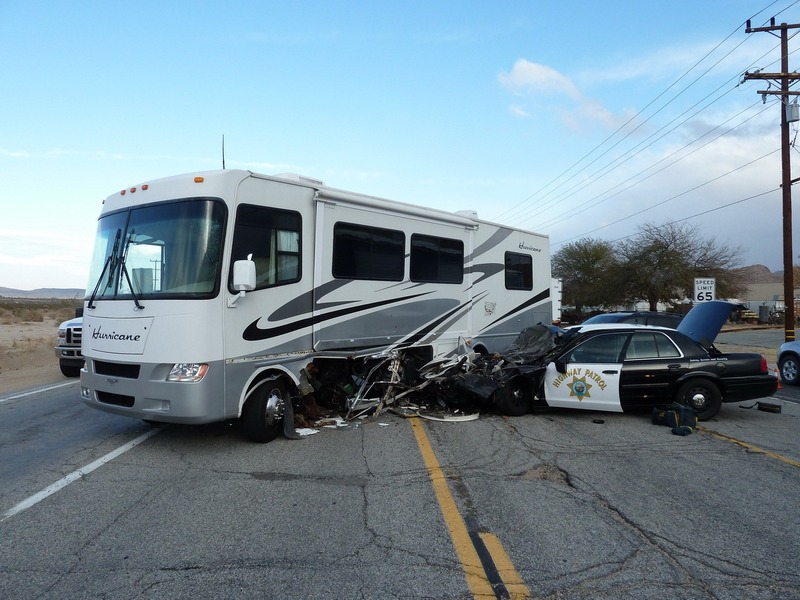 The 78 year old suspect swerved his van to avoid Timm and Theresa’s RV as they pulled out into the road, but the chasing CHP Officer wasn’t able to react in time and collided with the RV. Next time you buckle up for a fun adventure, remember to drive carefully and stay alert.